MuzikMan's Reviews And News: Rockabilly Guitarist Danny B. Harvey Releases A New Album With Former Devil’s Daughter Mysti Moon! Rockabilly Guitarist Danny B. Harvey Releases A New Album With Former Devil’s Daughter Mysti Moon! Los Angeles, CA - Get ready to stomp along with a brand new set of recordings from veteran rockabilly guitar slinger of The Head Cat (with Lemmy & Slim Jim Phantom), 69 Cats, and The Rockats, Danny B. Harvey! 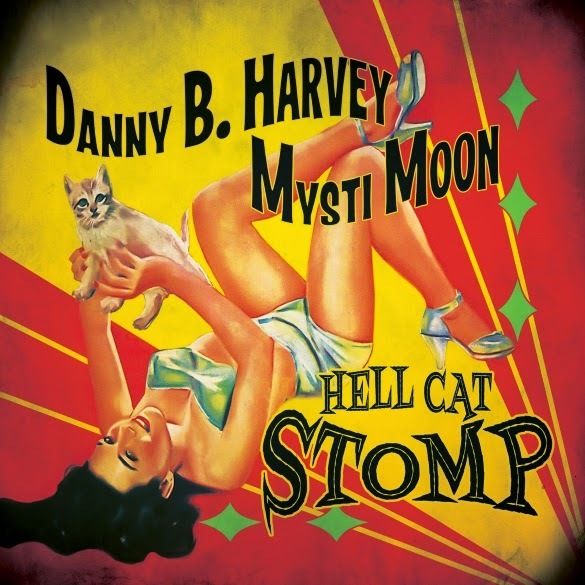 The album is called Hell Cat Stomp and is an inspired collaboration between Harvey & sultry vocalist Mysti Moon, formerly of The Devil’s Daughters, to be released on Cleopatra Records October 14! In sum, “This is the album I’ve always wanted to do, paying homage to my heroes from the early days of Jazz, Blues and Country music. The very beginning of modern music, long before Rock’n’Roll existed! Mysti is the perfect collaborator for me to use on this project as her voice and enthusiasm inspires me to make a great record. We sweated, sang and played our hearts out and made an album we’re both very proud of!